India’s GDP grew 8.2%, the highest in two years, during April-June 2018 (Q1 2018-19). 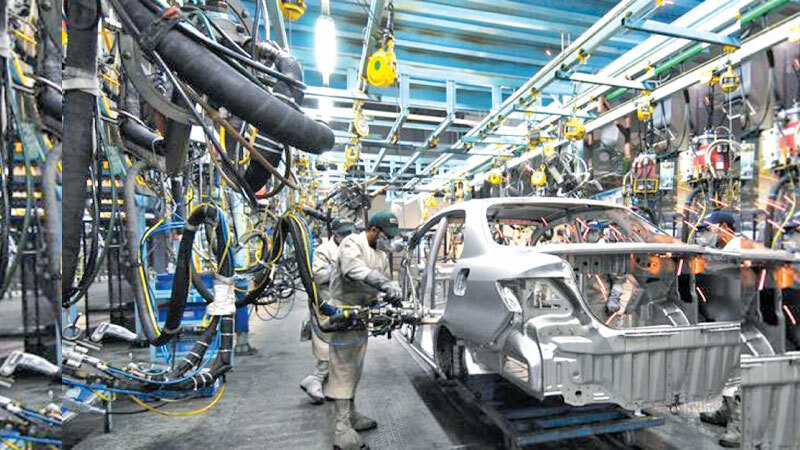 The headline growth numbers, however, do not capture the macroeconomic dynamics currently at play in the Indian economy. While the larger economic picture is not one of immediate crisis, there are factors, especially on the external front, which should be cause for concern. Economic growth: The 8% plus GDP growth is more a result of the base effect due to demonetisation’s disruption than any drastic increase in the level of economic activity. This can be seen from the trend in the two-year compound annual growth rate (CAGR) of GDP, which shows economic growth to be stagnant, and slightly lower, compared to the performance before note ban. (Chart 1) To be sure, even a 6.8% GDP growth rate is not bad and India remains the fastest growing major economy in the world. Terms of trade between agricultural and non-agricultural sectors is an important political economy contradiction in India. Roughly speaking, terms of trade can be thought of as the ratio of prices paid and received by various sectors in an economy. The difference between growth of Gross Value Added at current and constant prices for agriculture, industry and services can give an idea about these trends in the economy(Chart 2). 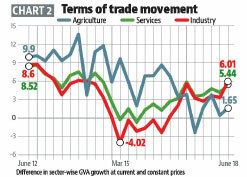 As can be seen in the Chart 2, the sectoral deflator for agriculture had started declining from the last phase of the previous United Progressive Alliance (UPA) government. In September 2017, agriculture’s deflator went below the values for industry and services, which suggests that prices of agricultural commodities were rising at a slower pace than the other two sectors. Things changed in the last quarter when the agriculture deflator shows a slight increase. This trend will probably continue after the government’s decision to significantly (compared to previous years) hike Minimum Support Prices for Kharif crops in July. If the government can maintain a close to 7% overall growth rate with improvement in terms of trade for agriculture, it can expect strong political tailwinds in the 2019 elections. The question is whether this can continue. Inflation and the external sector: Inflation and growing problems on the external front are emerging as major headwinds. The Reserve Bank of India’s (RBI) monetary policy committee noted the hike in MSPs and rising oil prices as potentially important drivers of inflation in its last meeting. Under the new inflation-targeting framework, RBI is bound to raise interest rates in case it expects inflation to rise. The government is expected to maintain the formula of MSP giving a 50% guaranteed return over cost of the cultivation (the so-called A2+FL measure) in the next Rabi season as well. Oil prices are expected to remain tight in the near future. India could face a bigger oil shock if it agrees to adhere to US sanctions on stopping oil imports from Iran. A depreciating rupee will further add to the inflationary impact of the rise in oil prices. Even on a standalone basis, these developments are likely to drive down growth. RBI’s rate hikes will increase the cost of investment and conducting business. A higher import bill due to rising oil prices will reduce GDP figures by fall in net exports. This will further trigger inflation and probably a rate hike cycle. The real impact of these developments could be even bigger. Last week, the RBI reported a significant reversal in foreign portfolio investment (FPI) in the country. There was a net outflow of $8.1 billion during Q1 2018-19 compared to a net inflow of $12.5 billion during Q1 2017-18. This is only the third quarter in which the country has recorded a net outflow of FPI under this government. In absolute terms, the value of net FPI outflows in the last quarter was the second highest since September 2003. The ratio of total foreign exchange reserves and India’s imports in Q1 2018-19 was the lowest since Q4 2014-15. At a time when trade wars threaten the rule-based global trade regime, an exogenous shock could create a big disruption on the external front. Avoiding any such mishap will require clarity and close coordination between the government and RBI. This does not seem to be the case right now. Reactions on the falling value of rupee are a case in point. While government officials, including the finance minister, have given statements downplaying the fall in the rupee’s value, reports suggest that the government has asked the RBI to soften the rupee fall and is also contemplating selling deposits denominated in foreign currency. In an interview to Bloomberg Quint, former RBI governor Y V Reddy rightly pointed out that government should resist from commenting too much about the exchange rate as it confuses the markets. If at all the government expresses an opinion, it should be with intent, Reddy added. In this case, this could imply that the government wants the rupee to deteriorate even further. To be sure, the former RBI governor’s advice is not easy for the Bharatiya Janata Party-led government to follow.